Are you keen on Fly Fishing? Well so are we! We’ve been fly fishing some of the Best places within a few hours of Vancouver since the early 1990’s. And providing guided fly fishing in Vancouver since 1996. When you clock off work on Friday afternoon and all you can think about is fly fishing the last thing you want to do is drive forever. Fortunately there are a myriad of fly fishing options quite close to the city of Vancouver. 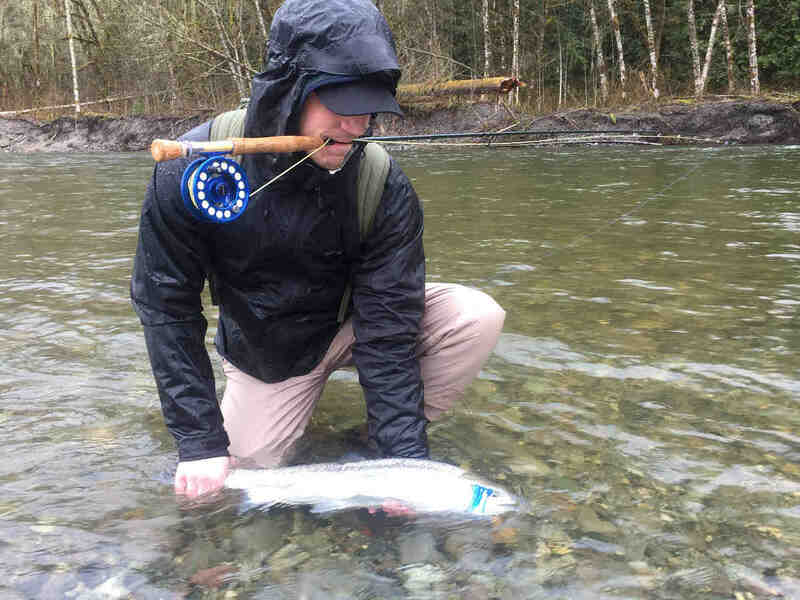 What’s the best fly fishing in Vancouver? When’s the best time for fly fishing in Vancouver? 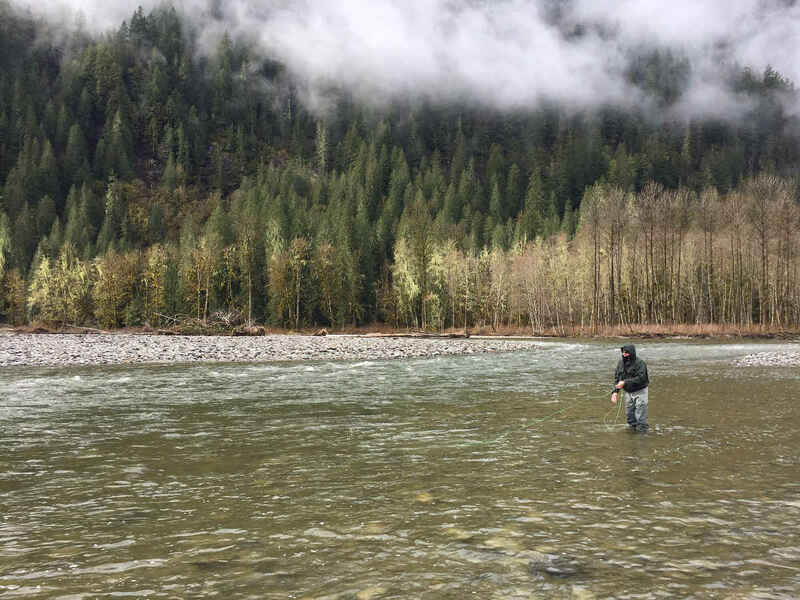 British Columbia has an endless supply of top fly fishing destinations so it’s no surprise there’s a ton of them near Vancouver. Without a doubt this is the Best Trout Fly Fishing available in Vancouver, British Columbia. Why you ask? 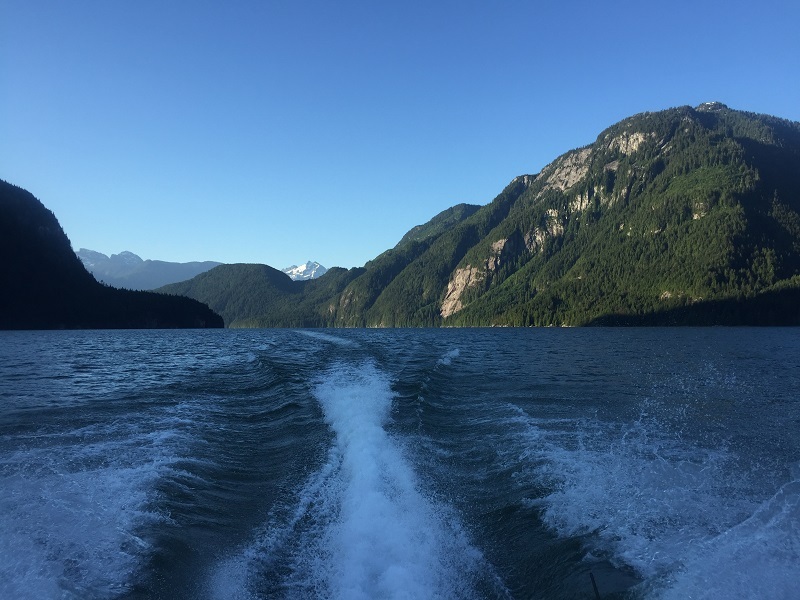 For us it’s the combination of a super scenic jet boat ride up Pitt Lake, into the upper Pitt River and a fly fishing venue that is comparable to some of the best places on Earth! Glacier capped mountains dominate the scene here along with some old growth rainforest settings. Sure the scenery is great but the fishing is equally as good if not better. There’s only 2 ways to get here. Jet boat or helicopter. That’s unique as it’s only 70 minutes from downtown Vancouver. The lay of the land is the reason. Rugged coastal terrain. Now about the Trout fly fishing here. 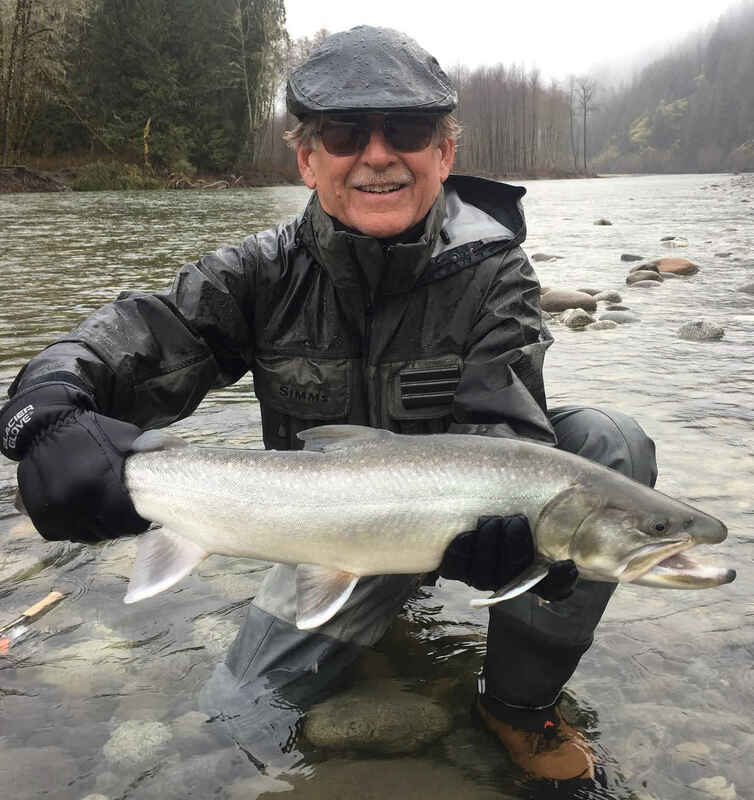 The upper Pitt River is host to a enormous Sea-run population of Bull Trout that start their journey into the river around mid May every year. This usually goes into mid July. Weather patterns play a key role here and late Spring to mid Summer offer ideal conditions for this. We limit our trips hre during this peak time. Upper Pitt River Bull Trout tend to average 2-5 lbs but fish over 10 lbs are not uncommon. These Bull Trout are typically bright silver, indicative of the sea-run status. Need a Guided Trip Here? 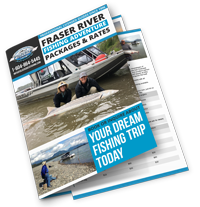 Our Pitt River fly fishing trips include all high end fly tackle, waders and a good offering of hearty organic food to fuel your day. A beauty upper Pitt Bull Trout! Salmon jumping on the line? This could be described as rather easy fishing. The kind where fish seem to jump on your line! Imagine a river stuffed with Salmon and your fly swings right in front of them over and over for hours. This is why Squamish River Pink Salmon fly fishing is one of the Best fly fishing venues in Vancouver. Getting here requires a 55 minute drive northward from Vancouver on the scenic Sea to Sky highway. 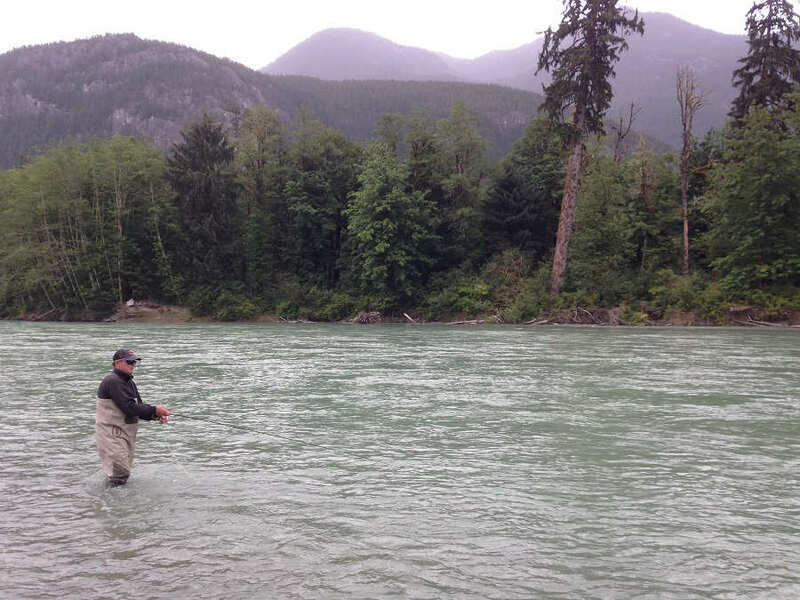 Like most fly fishing locations in the Vancouver region, the Squamish River is a typical West Coast setting. Surrounded by glacial capped mountains over 7,000 feet, rainforests and wildlife such as Elk, Deer and Black Bear. It’s no wonder that just being here brings new life to the soul. 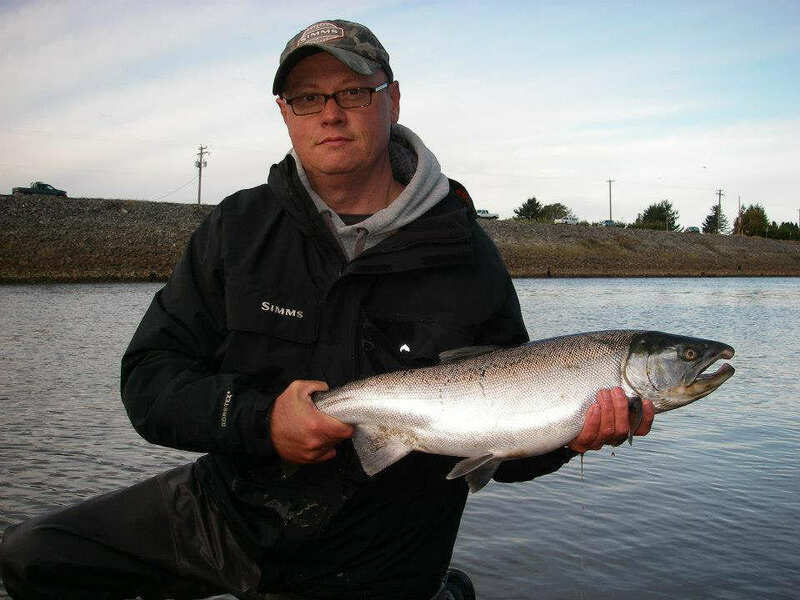 Pink Salmon will average 4 – 8 lbs but they can get up to 14 lbs. They are only hours from the Pacific Ocean and thus offer tremendous scraps on 7-8 weight fly gear. Swinging flies or stripping both work using floating line and sink tip. Any Pink coloured fly in sizes 2 to 8 can work. Need a fully guided trip? All our guided fly fishing trips include the finest tackle available and we can provide hotel pickup from Vancouver..
A place of beauty & tranquility! Although 3rd on the list of Best places to go Flyfishing this is our 2nd Best Trout Fly Fishing available in Vancouver, British Columbia. The Squamish River holds true to it’s reputation as a quality fly fishing destination. The lay of the land here is breath taking. This glacial fed mid size river is 80 km long and holds at least 30 km of very fishable fly water in the lower half. Like many river basins on the West Coast the geography here is dominated by glacier capped mountains that suddenly jut out from the narrow valley floor. This is rainforest country. Very large Douglas Fir trees, Cedars and Alder can be seen everywhere. But then there’s the wildlife! Residing in the Squamish River Valley there is: Elk, Deer, Moose, Mountain Goat, Cougar, Wolf, Lynx, Black Bear, Grizzly, Bald Eagles and several water fowl species. 50 – 60 minutes North of Vancouver. Getting here is easy along the scenic Sea to Sky highway which eventually goes to Whistler ski resort and beyond. The Squamish River holds a good population of resident and sea-run fish. This includes Bull Trout, Steelhead, resident Rainbows and Cutthroat. 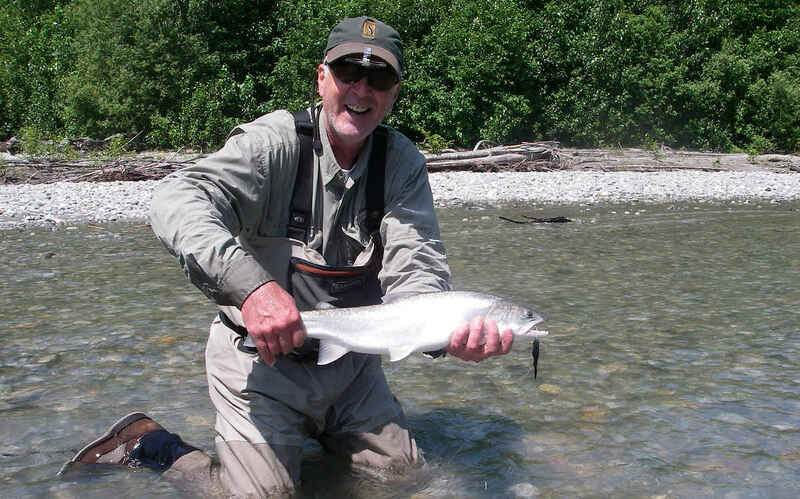 Squamish River Bull Trout tend to average 2-5 lbs but fish over 10 lbs are encountered each season. 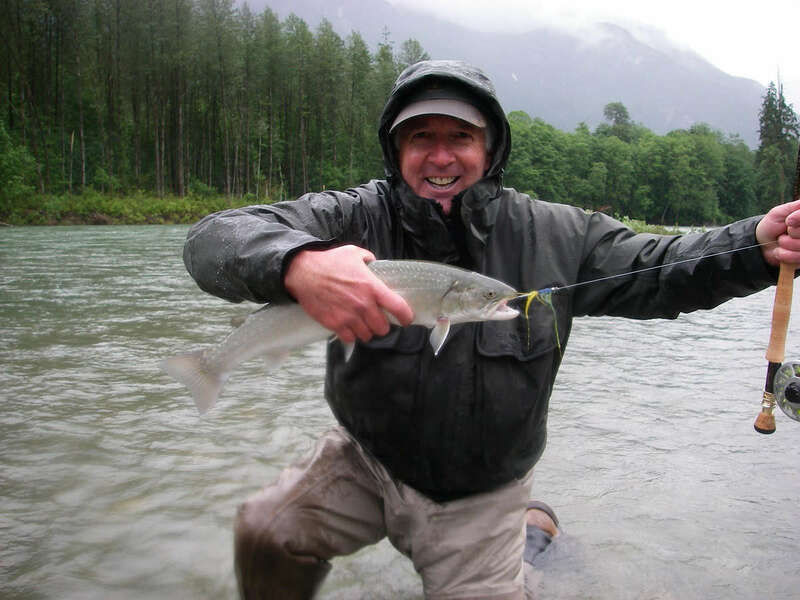 The sea-run Bull Trout are typically bright silver, the rezzies tend to be a bit less chrome and show shades of natural colors to blend in to the river bottom easier. 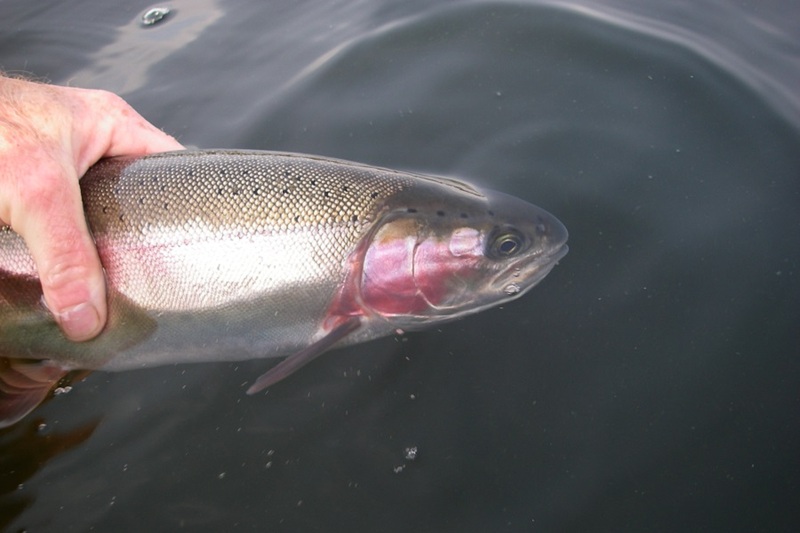 Steelhead are the largest trout and are specifically sea-run. Sizes range from 5 to 15 lbs. We fish here by driving to a specific location or 2 and then it’s walk n wade. We can cover several large runs, riffles and pools as you swing our custom home made flies in front of feeding fish. There’s also raft trips available that allow you to cover more water. Fish here typically slam your fly. This is wet fly fishing only. We use 7-8 wt rods, floating main line with Rio sink tips. As guides we NEVER get bored of fly fishing here !! Our Squamish River fly fishing trips for Trout include all high end fly tackle, waders and a good offering of hearty organic food to keep you going. We love the scenery here! 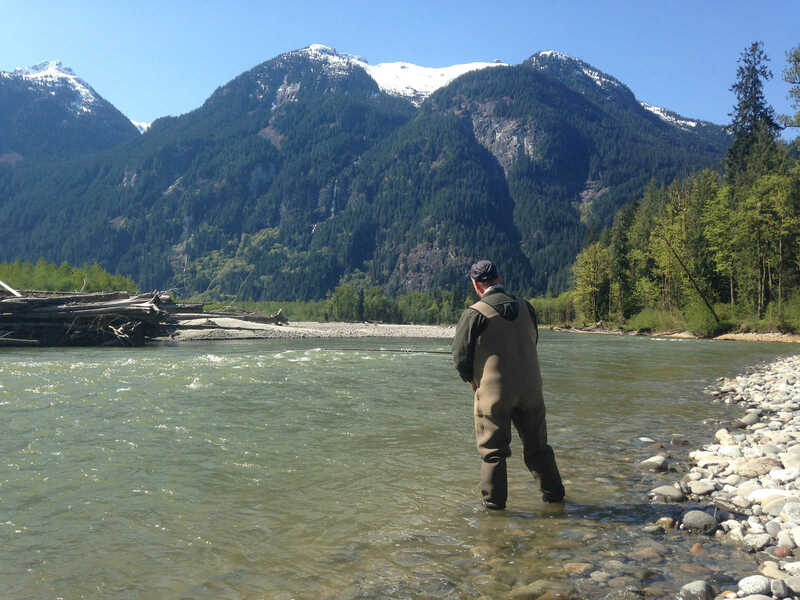 The Fraser River Valley is on our list of Best Fly Fishing places near Vancouver because of one primary factor. Variety of locations and species within this region. There are 5 river systems in the area and 5 Pacific Salmon to choose from. 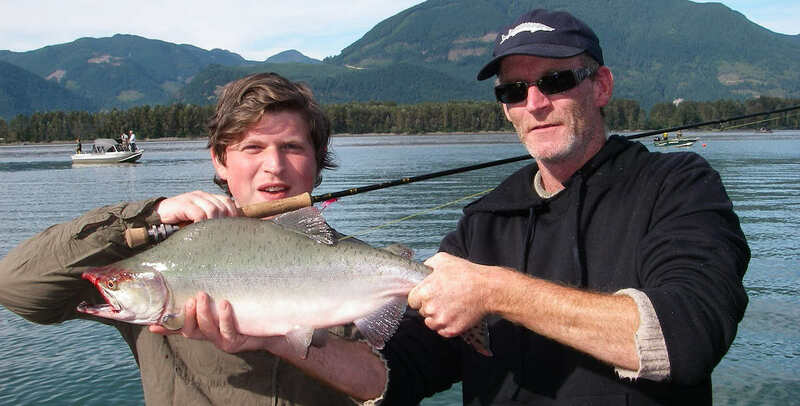 Chum, Coho, Pink are the main salmon that are easy to get fly fishing in the Fraser Valley. 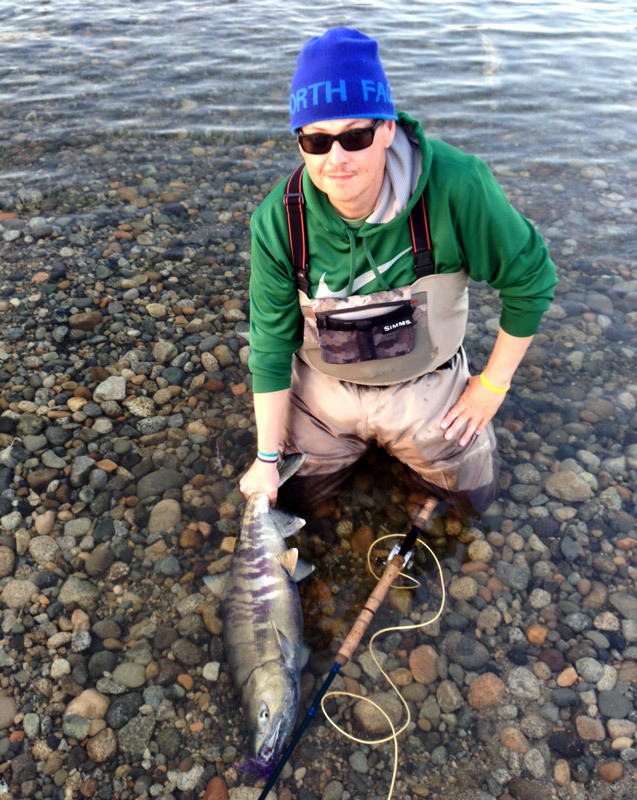 There’s also Chinook and Sockeye but they’re much tougher to get on the fly. The Fraser River Valley encompasses a large area 1 hour east of Vancouver. It includes communities like Mission, Abbotsford, Chilliwack and Agassiz. Salmon will be available to catch when they return from the Pacific ocean to spawn. Prime time is October and into early November every year. In odd years there will be Pink salmon in September. With a jet boat we can access dozens of hot spots on the Fraser River and it’s tributaries. 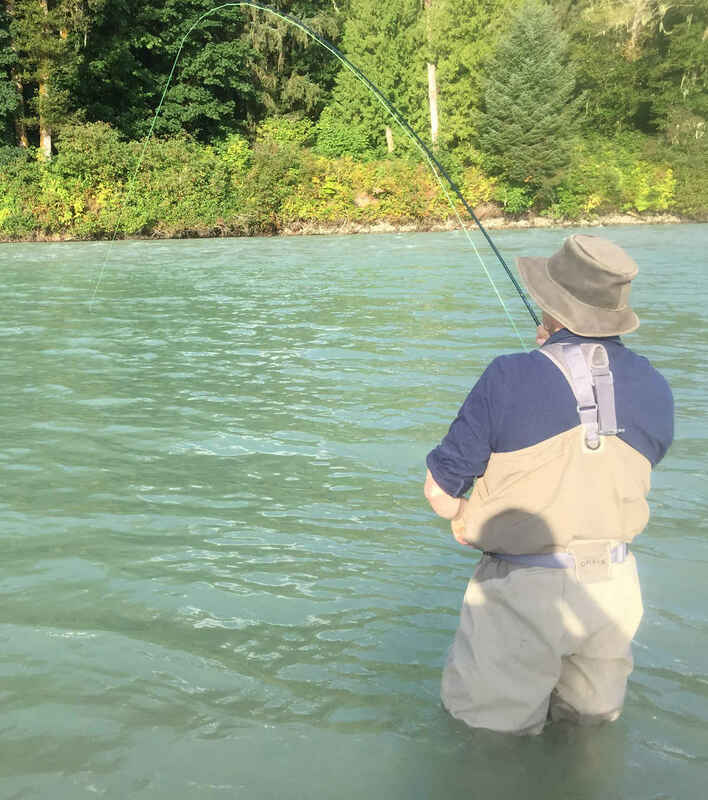 We will fish on the Fraser, Harrison, Vedder, Nicomen, and Stave rivers. The art of fly fishing is complex at times, especially when you’ve got such variety here. What to use?, how to use it? Where? When? These are all questions that can be answered by a professional fly fishing guide or tackle shop staff. All our fly fishing trips include the finest tackle available and we can provide hotel pickup from Vancouver..
Loads of Rainbow Trout and quiet wilderness! Our 5th on the list of Best places to go Flyfishing is a little different from the usual river scene but needs to be here because it’s truly a quality fly fishing venue. This region we’re talking about here is in the Merritt area. This is about 2.5 hours East of Vancouver. There are plenty of lakes to choose from in the area 20 km south and East of Merritt. We have had over 2 decades of experience fly fishing dozens of lakes in this area with great success. It’s tough to say which lake is better. They’re all good. Each person tends to adopt their favourite lake for various reasons. Size of fish, number of fish, ease or difficulty of access and the setting are all good reasons. None the less you will find a wonderful experience here. And perhaps a tasty Rainbow Trout for dinner over the camp fire! Besides excellent fly fishing there’s the scenery. Unlike the rugged west coast terrain of sharply rising snow capped mountains the Merritt area is more rolling plateau country where Lodgepole & Ponderosa Pine trees and Aspen & Birch dominate. Free range cattle roam almost everywhere too. Everything is drier here. The dirt forest service roads are the main access points to almost every fishable lake in the area. We highly recommend a good off road map book like BC Backroads Mapbook. They will also provide some fly fishing info to assist you. This is stillwater fly fishing. In laymans terms that means a lake. There’s 2 ways to fly fish here. Casting and stripping your fly(trolling is a weaker substitute) or suspending your fly under a strike indicator in the feeding zones. This latter method doesn not involve movement. Anchor up your Jon boat or Pontoon boat, cast out and let your midge aka chironomid sink. When it’s in the right zone and depth your indicator will vanish provided your fly is the right size and colour. A lot of things have to be just right but when they are: LOOK OUT. You will start hooking Rainbow’s like crazy!! We use 4-5 wt rods, floating main line with 4-6 lb flourocarbon leaders. 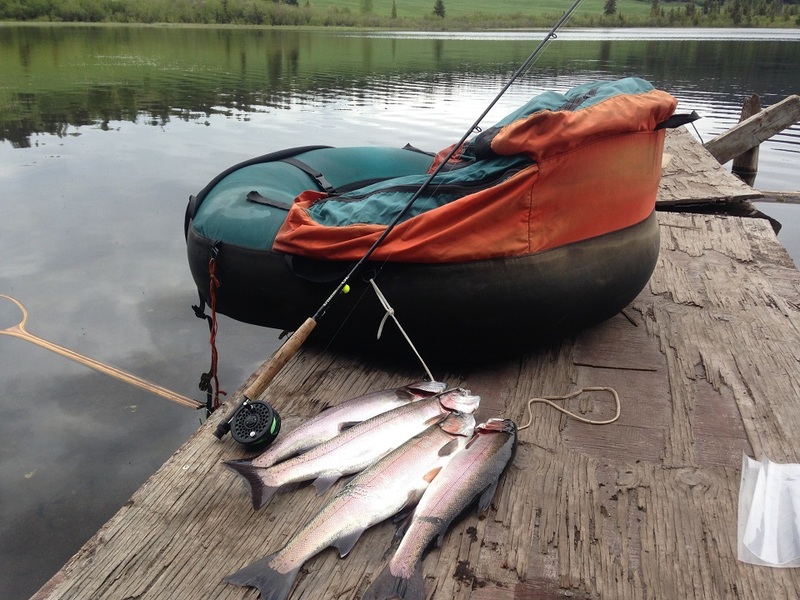 For years I have really enjoyed stillwater fly fishing out of a float tube(belly boat). They are stealthy, quiet, and you always have both hands free to fish properly. You are really in touch with the lake environment. But I have recently been using small Jon boats with a dual anchor system. These are great when it’s windy on the water. 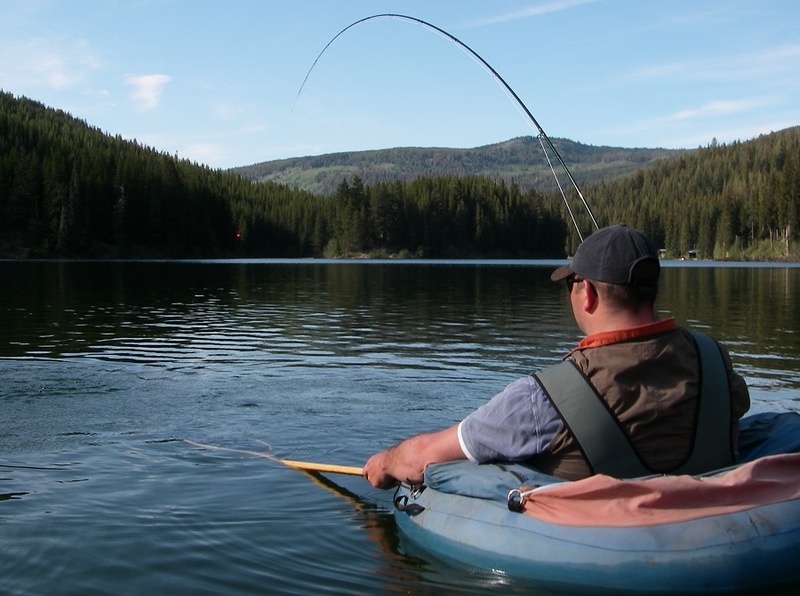 Get out there and enjoy the #5 Best fly fishing spot within 3 hours of Vancouver. If you can, try to take in all the great fly fishing that the Vancouver and southwest BC has to offer! Fish on in the back country!